Bottled Beauty: Rave: Napoleon Perdis Barely Blushing in "Rouge"
Rave: Napoleon Perdis Barely Blushing in "Rouge"
When I went to the Napoleon Masterclass, I bought the Barely Blushing tint in Rouge, which is a gorgeous berry colour. It's a tint that can be used on your lips or cheeks, and is available in 2 colours, Rouge and Buff. When I first used this, I used it on my cheeks. 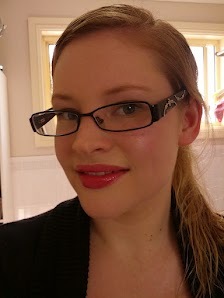 While it's a gorgeous cheek tint, on my pale skin it just looked more like a rash than a flush of colour. But when I applied it onto my lips, I fell in love. It gives your lips the most beautiful colour. It looks like you've been eating raspberries. I like to layer the tint to really build up the colour to make it quite dark. I like to leave it bare for a more natural look. If you love a glossy look, just apply a clear gloss over the top. The great thing with this formula, is that it's buildable in colour so you can make it as sheer or as dark as you want. Because of this so many different skintones can use it. The tint does make your lips feel dry once it has set, but that's easily fixed by applying a balm or a gloss over the top. It's easiest to apply with your finger, but can also be applied with a lip brush. Are you a fan of tints? What's your favourite one? The colour is lovely on you! The Masterclasses are amazing! I want to go to another one. Thanks sweet. Definitely check it out. It really is great. Totally loving this tint right now, and since I'm slightly more olive than you, it works brilliantly as a cheek tint on me. I still love Benetint though, it's a classic! On a random note are they prada glasses? I think i have the exact same pair!